“Take Your Girlie to the Movies” was originally a hit in 1919 by famed vocalist Billy Murray, the most popular male singer in America before Al Jolson. The song reveals how quickly the movie theater became a popular setting for the courtship ritual, and includes references to popular movie stars of the Teens (for instance, Billie Burke, perhaps best known to modern audiences as Glinda, the Good Witch of the North, in The Wizard of Oz), as well as social mores of that earlier era. According to journalist Jim Walsh, Billy Murray sold more records than any other pop singer in America between 1910 and 1920. Prior to the era of the compact disc, Murray’s legacy was kept alive by acoustic era record collectors and students of the early history of the phonograph. They exchanged discs and cylinders as well as dubs on open reel tape and cassettes. Because Murray spent much of his professional time in the studio rather than performing live, his recordings comprise the bulk of his legacy. Murray was an extremely popular singer as early as 1905. By June 1906, Murray’s recording of “The Grand Old Rag” was the biggest-selling record in the Victor Company’s history. Songs recorded by Murray in 1905, such as “In My Merry Oldsmobile” and “Everybody Works But Father,” remained in record catalogs until the early 1920s, suggesting their popularity. In 1909 Murray formed the American Quartet (known as the Premier Quartet on Edison cylinder releases), best known for its interpretations of ragtime and novelty songs. 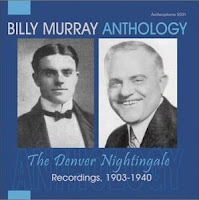 Among the group’s early bestsellers were “Casey Jones,” “It’s A Long, Long Way to Tipperary,” “Moonlight Bay,” and “Oh, You Beautiful Doll.” By the 20s, Murray wasn’t quite as popular as he had been (his “old-fashioned” music was being displaced by jazz), but he still had hits with “(Down by the) O-H-I-O (I’ve Got the Sweetest Little O, My! O! )” (with Victor Roberts), “Strut, Miss Lizzie,” “That Old Gang Of Mine” (with Ed Smalle), and “Don’t Bring Lulu.” The latter song, “Don’t Bring Lulu,” was re-recorded by Kay Kyser’s band in 1935, although the song had been part of his band’s repertoire for at least a year. At the same time, Kyser also recorded Murray’s earlier hit, “Take Your Girlie to the Movies” (Sully Mason, vocal), and likewise had a minor hit from it. Hence from the Teens on, the movies had been a subject of popular music.